Chicken Gumbo is one of the South’s favorite recipes during Mardis Gras. Gumbo is made with a wide variety of meats like chicken, ham, bacon, oysters, crab, shrimp, and beef. 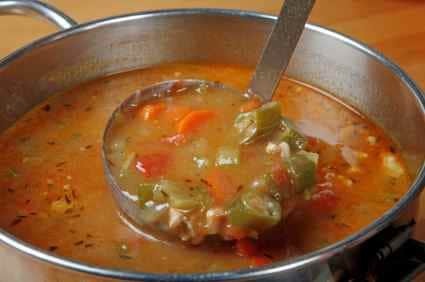 This chicken gumbo a perfect gumbo soup recipe to try if you have never had this famous soup before. If you live in the South, there are large discussions regarding what makes a proper gumbo. The proper gumbo is the one you enjoy. Some varieties include chicken, chicken and sausage, seafood, there is also a meatless variety. Gumbo is basically meat cooked in a spicy and flavorful thick soup. This much-loved comes from New Orleans. While it is very difficult to sort out what part of this dish came from West Africa, which came from the French, and what came from the Choctaw Indian nation. We can all agree that gumbo really personifies America’s melting pot. Gumbo did get its name from West Africa. Gumbo received its name from a derivation of the word Okra. Why does everyone seem to love gumbo? Aside from it being completely delicious. It is a dish that is is very forgiving of the cook. Measurements do not have to be exact, ingredients can be modified for what you have on hand. After Thanksgiving, it isn’t unusual to see turkey put into gumbo. You have three basic choices to thicken gumbo, you can use two of them, but no good check would use all three methods of thickening this soup. Roux – Roux is likely the most well-known way to thicken gumbo. The roux is a paste of flour and fat that has been browned. How dark you like to prepare your roux is all up to you. Okra – the original gumbo thickener. File Powder – is made from ground sassafras leaves. File is generally added at the end of the cooking process. It is believed file became a thickener in gumbo when okra was not in season. Love Gumbo? Be sure to check out these gumbo recipes. You can make great Chicken gumbo with this easy recipe. In a large pot, fry the bacon. Remove the bacon and set aside. Add the oil to the bacon drippings that are in the pot. Dredge the chicken in flour and brown them in the pot. This may have to be done in several batches. Pour the chicken broth over browned chicken and boil. Add all remaining ingredients and simmer for 30 minutes. Taste and season before serving. You may add the bacon to the soup, if desired. Serves 8.
called I love this soup. I was wondering can you freeze this soup? I think this would be a great soup to freeze.